Mexico’s economy is especially strong in the service sector. In 2017, this sector represented 66.2% of GDP and employed 62% of the labor force, while the industrial sector represented 31% of GDP and employed 23.8% of the labor force, and the primary sector represented 2.8% of GDP and employed 13.6% of the labor force. The Mexican economy has grown at an average annual rate of 2.2% in the last ten years, in spite of the adverse global environment. It is foreseen that it will continue growing during 2019 and 2020. 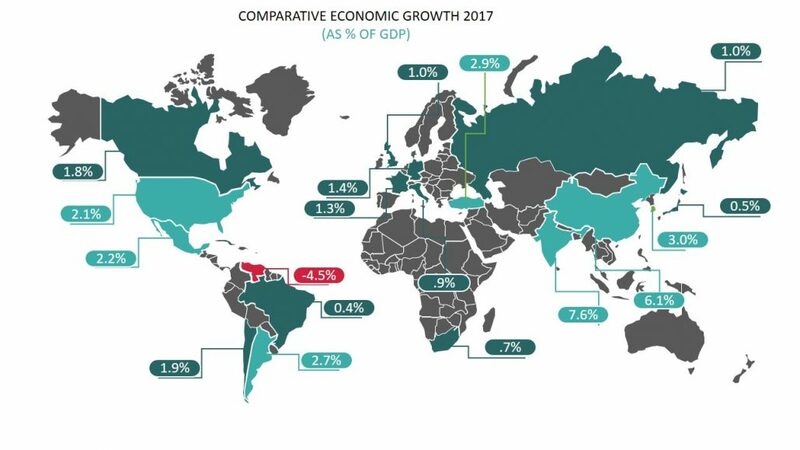 This growth will be strengthened by the economic development strategy of the Mexican Government that includes a consolidation of domestic consumption as a result of the implementation of social programs and financial inclusion, an increase of private investment in infrastructure and strategic sectors, a higher level of public investment, and an increase in exports as a consequence of the reconfiguration of global value chains. Instituto Nacional de Estadística y Geografía (INEGI), PIB and National Accounts. Mexico’s macroeconomic effectiveness is supported by a series of economic, financial, fiscal, and commercial policies implemented during the last years, that have strengthen its internal market. Based on these factors, some analysts, like The Economist Intelligence Unit, place Mexico by the year 2050 as one of the eight largest economies in the world, crowding out countries like the United Kingdom, France, Italy and Russia. Thus, Mexico is considered to have one of the most positive perspectives for the following years among developing countries and even among developed economies. Implement policies to increase savings and allow a more efficient allocation of resources in the economy. Ensure a higher rate of return of investments, a more efficient combination of factors of production, and a better allocation of resources, supported by a pacification strategy, the reduction of violence, fight against corruption and, in general, the strenghtening of the rule of law and governance. Will encourage de development of human capital among the young population. Bloomberg with Information of “The Economist Intelligence Unit”, “Mexico to Overtake Russia by 2050 as U.S. Slides” June 23rd, 2015.